I read this beautiful book by C.S. Lewis while teaching on love last month. The book was originally published in 1960 and was republished in 1988. There is an audio version of this series that is, I understand, the only recording of C.S. Lewis. 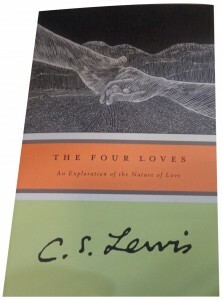 Lewis calls storge ‘‘affection’’ and defines it as the normal love among family members. The Bible only uses the word compounded to another (Rom 1:31, 12:10, 2 Tim 3:3). Philos is called ‘‘friendship’’ and, of course, appears often in the New Testament. This is a splendid chapter on a concept which should be renewed in our churches and yet kept separate from agape. Eros is a most interesting word coming largely from Greek mythology (the Roman Cupid). Lewis calls the evil side Venus (the lover of Cupid) and the neutral side (as in marriage) Eros. For agape Lewis likes the old English word ‘‘charity’’ because this is truly a giving love. Not used before the New Testament, this word is defined solely by God’s use of it. It is Lewis’ contention that few believers experience true agape (in 2 Peter 1 it comes last in the list). The value of the book to our generation is that we tend to lump all four meanings into one word ‘‘love’’ and then try to apply any Biblical reference any time we want. All four concepts are taught in the Bible but they are unique and should be kept that way. I have a greater appreciation for all four loves after having read the book.